Growing up, I spent most of my free time with my nose in a book. I was not athletic, I was not particularly popular, and lived in a crowded duplex with three generations of my family. 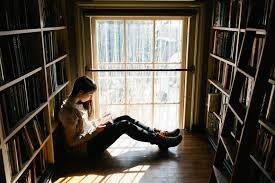 Reading was always my escape and I read voraciously. My parents, both teachers, had shelves of books and I loved looking at them, touching them, flipping through the pages. I can still picture the battered shelves with titles from O. Henry, Edgar Allen Poe, William Shakespeare, Sinclair Lewis and many more. When I was in grade school, I loved reading biographies, primarily those of women, Clara Barton, Louisa May Alcott, Marie Curie, Maria Tallchief and Isadora Duncan, just to name a few. It was through the lives of these pioneering women that I could imagine a world of possibilities for myself. It was around this time, that I also entered the world of fantasy through one of my all time favorites, “A Wrinkle in Time.” Even today I continue to love stories about time travel. There’s something about the mind-bending nature of the genre that keeps me thinking about it long after I’ve finished the last page. I even enjoy films about time travel, yes, “Back to the Future,” never ceases to entertain me, and the romance of “Somewhere in Time,” still haunts. As I grew up, I fell in love with mysteries. Yep, I had a small collection of Nancy Drew stories, but I quickly moved on to Agatha Christie, an interest that continues to this day. I love nothing more than to curl up with a good “whodunit,” especially when I’m on an airplane or on vacation. Then, I can enjoy the whole book in one sitting! Mystery readers know there is nothing more frustrating than putting the book down, only to return days (or weeks) later and not remember what is going on! As an adult, I fell in love with Harry Potter, and the writing of J. K. Rowling when my son wanted to read the books. I felt I should take a read, first, to make sure it was age appropriate for him. Of course, he moved on and I was hooked. Her writing was surprising, evocative and rich and I could not get enough. Eventually, my younger son found the books and together we explored the magical world of wizards. In recalling these books that changed my life, it’s clear to me that there is no one book that defines me. I guess if there is a theme, it’s that I am drawn to stories that spark my imagination, make me dream about the fantastic, and open my mind to a world of possibilities.